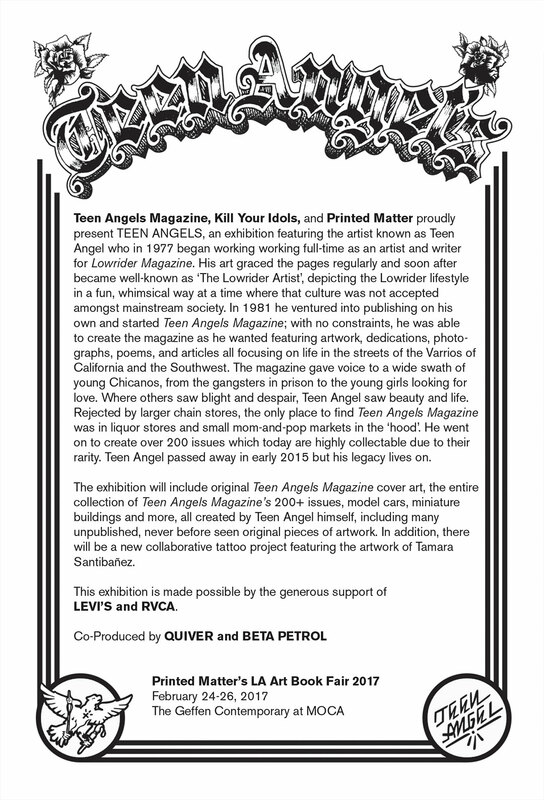 Teen Angels Magazine, Kill Your Idols, and Printed Matter proudly present TEEN ANGELS, an exhibition featuring the artist known as Teen Angel who in 1977 began working working full-time as an artist and writer for Lowrider Magazine. His art graced the pages regularly and soon after became well-known as ‘The Lowrider Artist’, depicting the Lowrider lifestyle in a fun, whimsical way at a time where that culture was not accepted amongst mainstream society. In 1981 he ventured into publishing on his own and started Teen Angels Magazine; with no constraints, he was able to create the magazine as he wanted featuring artwork, dedications, photographs, poems, and articles all focusing on life in the streets of the Varrios of California and the Southwest. The magazine gave voice to a wide swath of young Chicanos, from the gangsters in prison to the young girls looking for love. Where others saw blight and despair, Teen Angel saw beauty and life. Rejected by larger chain stores, the only place to nd Teen Angels Magazine was in liquor stores and small mom-and-pop markets in the ‘hood’. He went on to create over 200 issues which today are highly collectable due to their rarity. Teen Angel passed away in early 2015 but his legacy lives on. The exhibition will include original Teen Angels Magazine cover art, the entire collection of Teen Angels Magazine’s 200+ issues, model cars, miniature buildings and more, all created by Teen Angel himself, including many unpublished, never before seen original pieces of artwork. In addition, there will be a new collaborative tattoo project featuring the artwork of Tamara Santibañez. This exhibition is made possible by the generous support of LEVI’S and RVCA.